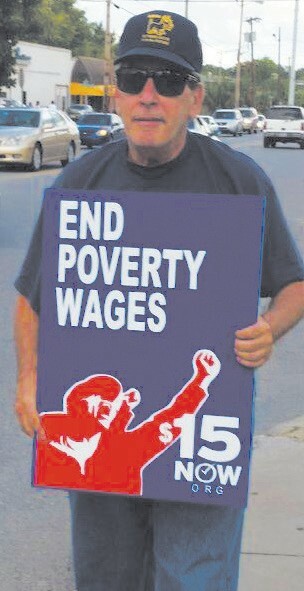 Phillip (Philly) Meyers, the president of RUFF (Retirees Unite for the Future), a Savannah based seniors’ activist group, reports that over forty demonstrators participated in an End the Poverty Wages Rally in Savannah, at the McDonald’s on the corner of Victory Drive and Montgomery Street, on Tuesday evening, November 10, 2015. Specifically, these demonstrators stood in support of thousands of low-wage workers’ striking nationwide for a living wage and for having voices on their jobs. Holding banners and signs asking for a living wage, targeted at $15 per hour, these demonstrators were met by enthusiastic support from many passing drivers, indicating approval by “honking” their horns, at this busy site and intersection. Philly Meyers adds that the Organize Savannah group is responsible for the success of this event. He describes Organizing Savannah as an outgrowth of Organizing the South. that is “dedicated to raising awareness, building community support, and making allies among groups and individuals.” In effect, Organizing Savannah serves as an umbrella for many of the activist groups in Savannah, including the aforementioned RUFF. Representatives from many groups participated in this rally for increased wages. This very impressive list included members of the Chatham County Democratic Committee(CCDC), RUFF, the Teamsters Union, the Savannah Regional Labor Council, mis-classified port drivers, Organizing for Action, the Sierra Coastal Group, the Letter Carriers’ Union, and OCCUPY Savannah. Organize Savannah acknowledges the presence of Alicia Blakeley at the rally. Ms. Blakeley is a candidate in the run-off election, taking place on Tuesday, December 1, 2015, for Savannah City Council- Alderman At-Large Post # 2. If there are questions or comments about the rally, Organize Savannah, RUFF, and other activist matters, please call Philly Meyers at 912-344-5127.